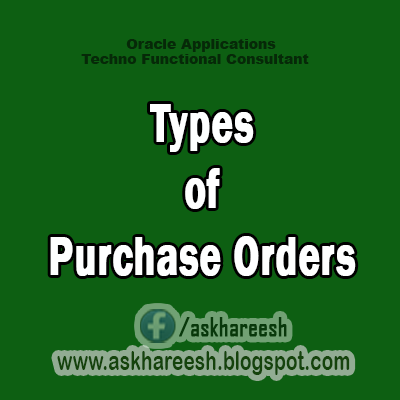 Oracle Purchasing provides the following purchase order types: Standard Purchase Order, Planned Purchase Order, Blanket Purchase Agreement and Contract Purchase Agreement. You can use the Document Name field in the Document Types window to change the names of these documents. For example, if you enter Regular Purchase Order in the Document Name field for the Standard Purchase Order type, your choices in the Type field in the Purchase Orders window will be Regular Purchase Order, Planned Purchase Order, Blanket Purchase Agreement and Contract Purchase Agreement. You generally create standard purchase orders for one–time purchase of various items. You create standard purchase orders when you know the details of the goods or services you require, estimated costs, quantities, delivery schedules, and accounting distributions. If you use encumbrance accounting, the purchase order may be encumbered since the required information is known. You create blanket purchase agreements when you know the detail of the goods or services you plan to buy from a specific supplier in a period, but you do not yet know the detail of your delivery schedules. You can use blanket purchase agreements to specify negotiated prices for your items before actually purchasing them. BPA are widely used in product manufacturing companies. You can issue a blanket release against a blanket purchase agreement to place the actual order (as long as the release is within the blanket agreement effectivety dates). If you use encumbrance accounting, you can encumber each release. You create contract purchase agreements with your suppliers to agree on specific terms and conditions without indicating the goods and services that you will be purchasing. You can later issue standard purchase orders referencing your contracts, and you can encumber these purchase orders if you use encumbrance accounting. You create a planned purchase order when you want to establish a long term agreement with a single source supplier with a commitment to buy goods or services. Planned purchase orders include tentative delivery schedules and accounting distributions. You then create scheduled releases against the planned purchase order to actually order the goods or services. A planned purchase order is a type of purchase order you issue before you order actual delivery of goods and services for specific dates and locations. Ascheduled release is issued against a planned purchase order to place the actual order. You can also change the accounting distributions on each release and the system will reverse the encumbrance for the planned purchase order and create a new encumbrance for the release. We are not responsible for any damages in whatever the form caused by the usage of the content of this blog or website. © 2014 - 2017 , All rights reserved. Best view in Chrome . The content is copyrighted to Hareesh Pothuguntla and should not be reproduced on other websites.